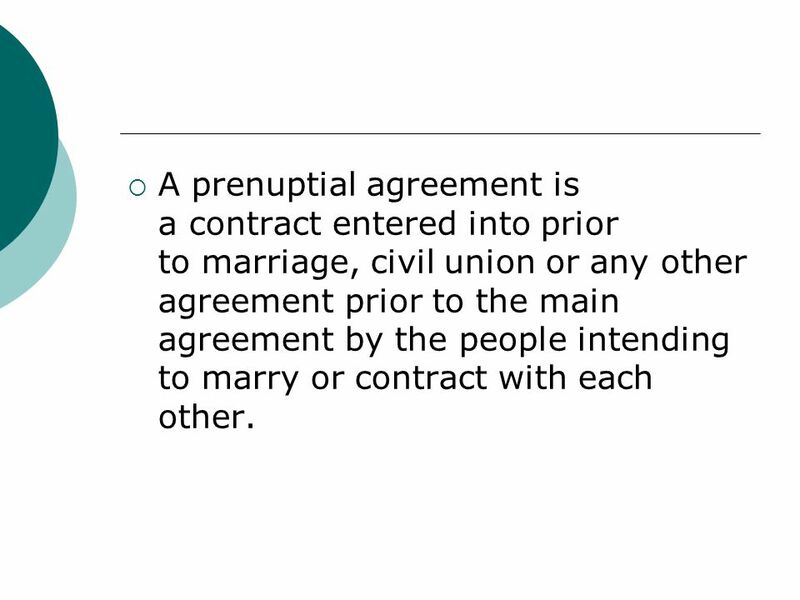 2 A prenuptial agreement is a contract entered into prior to marriage, civil union or any other agreement prior to the main agreement by the people intending to marry or contract with each other. The content of a prenuptial agreement can vary widely. 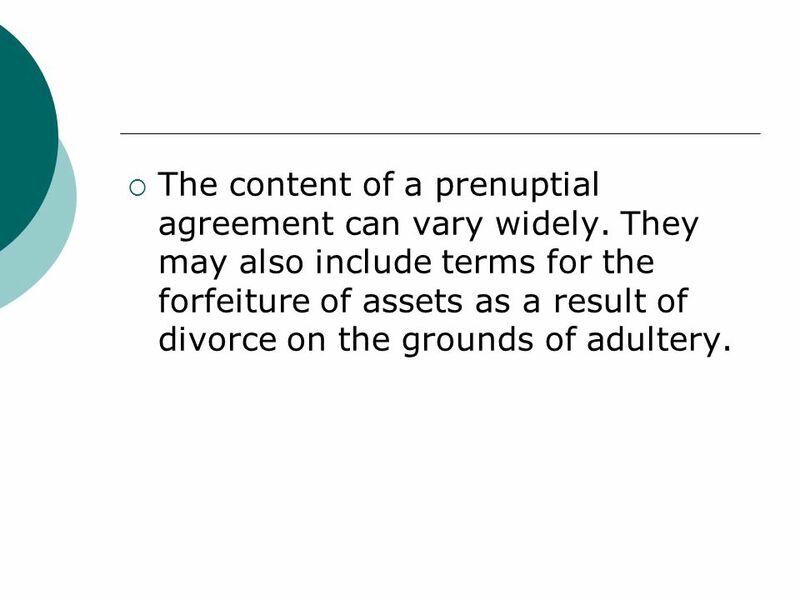 They may also include terms for the forfeiture of assets as a result of divorce on the grounds of adultery. 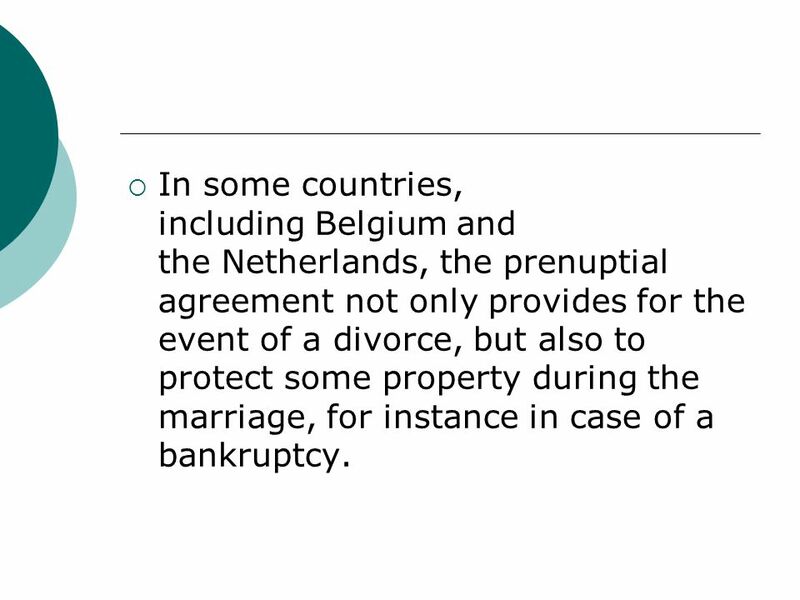 4 In some countries, including Belgium and the Netherlands, the prenuptial agreement not only provides for the event of a divorce, but also to protect some property during the marriage, for instance in case of a bankruptcy. 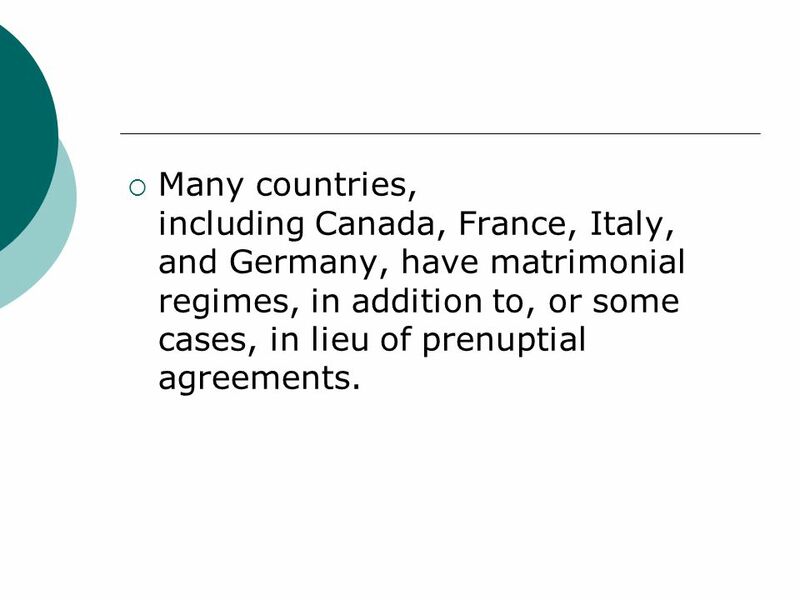 5 Many countries, including Canada, France, Italy, and Germany, have matrimonial regimes, in addition to, or some cases, in lieu of prenuptial agreements. 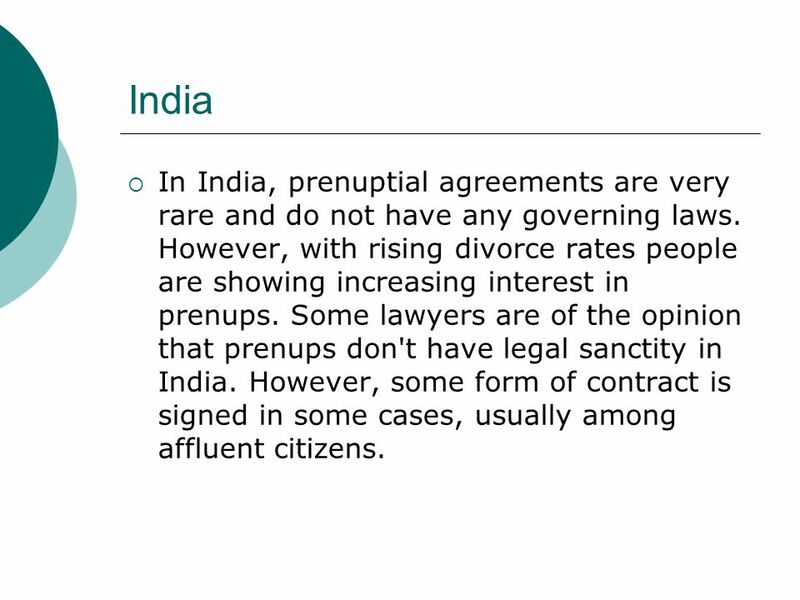 6 India In India, prenuptial agreements are very rare and do not have any governing laws. However, with rising divorce rates people are showing increasing interest in prenups. Some lawyers are of the opinion that prenups don't have legal sanctity in India. However, some form of contract is signed in some cases, usually among affluent citizens. 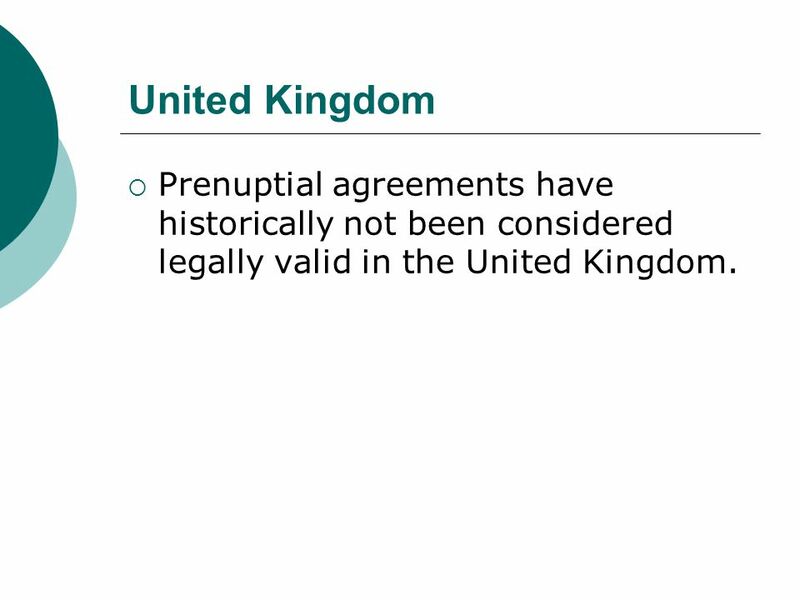 7 United Kingdom Prenuptial agreements have historically not been considered legally valid in the United Kingdom. 8 The USA In the United States, prenuptial agreements are recognized in all fifty states and the District of Columbia. Prenuptial agreements in all U.S. states are not allowed to regulate issues relating to the children of the marriage, in particular, custody and access issues. The reason behind this is that matters involving children must be decided in the children's best interests. 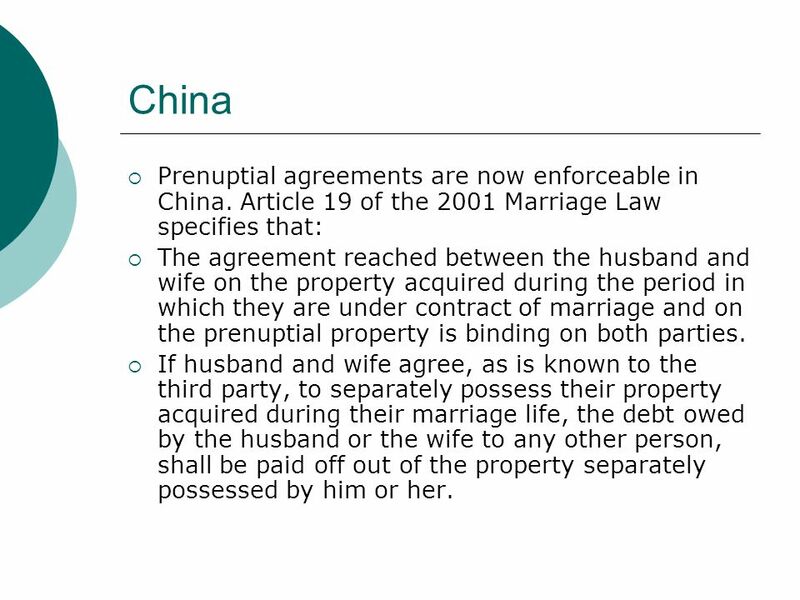 9 China Prenuptial agreements are now enforceable in China. Article 19 of the 2001 Marriage Law specifies that: The agreement reached between the husband and wife on the property acquired during the period in which they are under contract of marriage and on the prenuptial property is binding on both parties. If husband and wife agree, as is known to the third party, to separately possess their property acquired during their marriage life, the debt owed by the husband or the wife to any other person, shall be paid off out of the property separately possessed by him or her. Knowing The Basics of Divorce. Family law Family law is a complex practice area, regulated by rules that vary slightly from state to state. Family law. MARRIAGE BY CIVIL LAW Present by : Alfin Layindra ( ) FACULTY OF LAW UNIVERSITAS MUHAMMADIYAH YOGYAKARTA. Marriage ceremony, state recognition, cohabitation, arranged marriage, and divorce Global Perspectives. CONFLICT OF LAWS Unit 28. Preview TermsDefinitions “Foreign law” Jurisdiction Choice of applicable law Principles of the choice of law Rome Convention. Supreme Court Debate Should prenuptial agreements be given decisive weight?  Mediation is a dispute resolution process in which, as an alternative to judicial or administrative decision-making process, the parties are assisted. Marriage Laws and the Disabled A Comparison between the United States, ADA, UN, and Iran. Law for Business and Personal Use © Thomson South-Western CHAPTER 11 Contractual Obligations and Their Enforcement 11-1Transfer and Discharge of Obligations. Law for Business Mr. Bernstein Notes, pp Legal Considerations of Marriage December 5, 2014.  Do you know the origin of the custom of using a ring as an engagement and marriage token? › Answer: The circle of the ring represents eternity, a symbol. LECTURE 5 Theme: Family Law.. PLAN 1. Family Law. 2. Civil partnership. 3. Marriage. Divorce. What is the purpose of marriage? ● Do we still need to have marriage in our society? ● Benefits? ● Drawbacks? ● Who regulates marriages? ● State government. Canadian Family Law Audrius A. Stonkus Department of Law Holy Trinity. 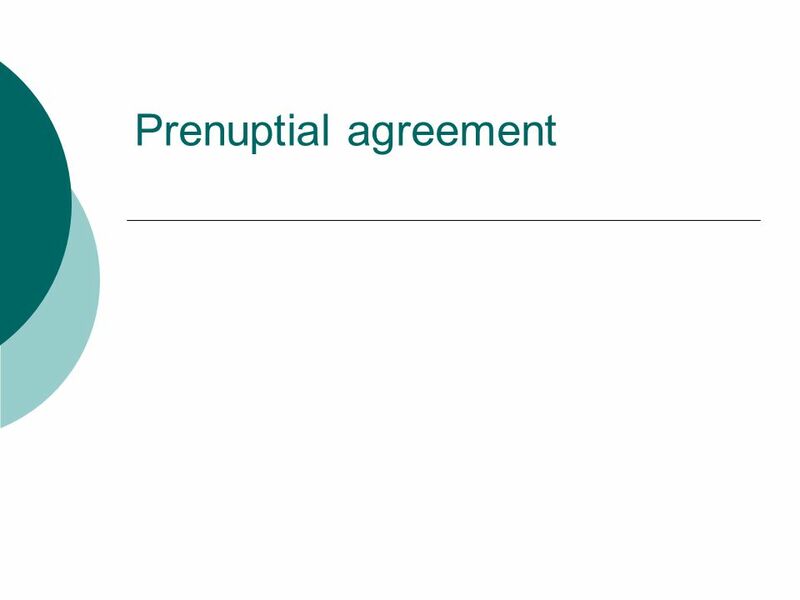 Legal Document Preparation Class 13Slide 1 Prenuptial Agreement This is an agreement that determines what will happen in the even of death or dissolution.